God never meant for His people to be "lazybones"! The following Bible verses make that crystal clear. Take a lesson from the ants, you lazybones. 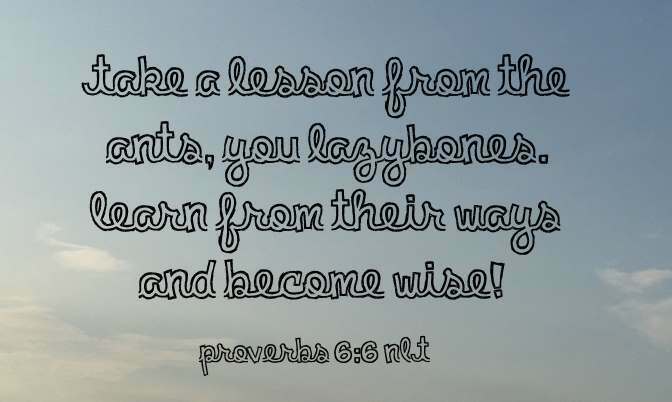 Learn from their ways and become wise (Proverbs 6:6 NLT)! But you, lazybones, how long will you sleep? When will you wake up (Proverbs 6:9 NLT)? Lazy people irritate their employers, like vinegar to the teeth or smoke in the eyes (Proverbs 10:26 NLT). Lazy people are soon poor; hard workers get rich (Proverbs 10:4 NLT). Work hard and become a leader; be lazy and become a slave. (Proverbs 12:24 NLT). Lazy people don’t even cook the game they catch, but the diligent make use of everything they find (Proverbs 12:27 NLT). A lazy person’s way is blocked with briers, but the path of the upright is an open highway (Proverbs 15:19 NLT). He also that is slothful in his work is brother to him that is a great waster (Proverbs 18:9). Lazy people sleep soundly, but idleness leaves them hungry (Proverbs 19:15 NLT). Lazy people take food in their hand but don’t even lift it to their mouth (Proverbs 19:24 NLT). Laziness leads to a sagging roof; idleness leads to a leaky house (Ecclesiastes 10:18 NLT). Despite their desires, the lazy will come to ruin, for their hands refuse to work (Proverbs 21:25 NLT). The lazy person claims, “There’s a lion out there! If I go outside, I might be killed!” (Proverbs 22:13 NLT). I walked by the field of a lazy person, the vineyard of one with no common sense (Proverbs 24:30 NLT). As the door turneth upon his hinges, so doth the slothful upon his bed (Proverbs 26:14). “But his lord answered and said to him, ‘You wicked and lazy servant, you knew that I reap where I have not sown, and gather where I have not scattered seed (Matthew 25:26). Never be lazy, but work hard and serve the Lord enthusiastically (Romans 12:11 NLT). That ye be not slothful, but followers of them who through faith and patience inherit the promises (Hebrews 6:12 ). And if they are on the list, they will learn to be lazy and will spend their time gossiping from house to house, meddling in other people’s business and talking about things they shouldn’t (1 Timothy 5:13 NLT).